Software giant Microsoft reportedly looking to significantly invest in the development of it’s mobile operating system, silencing rumours of the company acquiring a mobile manufacturer like Research In Motion (RIM) or Palm. Microsoft have just unveiled their newest mobile operating system, Windows Phone 7, announcing that it will release five handsets featuring the mobile platform. Whilst the Windows Phone 7 handsets are set to launch at the end of the year, it is also reported that they will continue the development of its older mobile operating system, Windows Mobile 6.x. Microsoft are said to be investing around $1 billion into the development of Windows Mobile, according to Bill Koefoed, the manager of Microsoft Investor Relations. A substantial investment into it’s own software development reveals Microsoft’s intentions into concentrate on delivering a solid operating system capable of rivalling the likes of Apple and Android instead of looking to buy a device manufacturer. Analysts have suggested that Microsoft will be able to create an operating system that is superior to other smartphone platforms but they wouldn’t have enough leverage in the mobile market to make the software a success. If Microsoft was to invest in a device manufacturer like Nokia, Palm or Research In Motion (RIM) they would not only be funding a buyout that was in the millions, possibly billions but also face the massive challenge of adapting their platform to be compatible with existing hardware. Android has showed how well a separate operating system can compete in the mobile market, although that is open-source. With this in mind, Microsoft will not be too worried about rebooting the Windows Mobile brand and releasing a brand new OEM operating system for vendors to work with. Success will be measured by Windows Phone 7’s market share in the mobile operating system segment, in which they represented 8% of the market in 2009. Although it is a low share compared to Nokia (47%) or RIM (20%), Windows Mobile still ranks higher than Android and Palm. 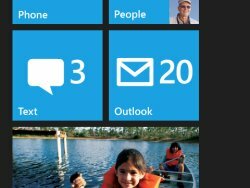 Judging from the initial screenshots of the Windows Phone 7 OS in action, Microsoft will release an operating system that will compete with today’s smartphones. We just have to hope that Microsoft use this investment to introduce new innovations into it’s operating system and not release a platform that is only just on par with today’s industry leaders.